""A splendid soldier," says the Army and Navy Gazette, "was lost to the army at Tel-el-Kebir in the person of Sergeant-major McNeill of the 42nd Highlanders, and it will be long ere his name is forgotten in the Black Watch." 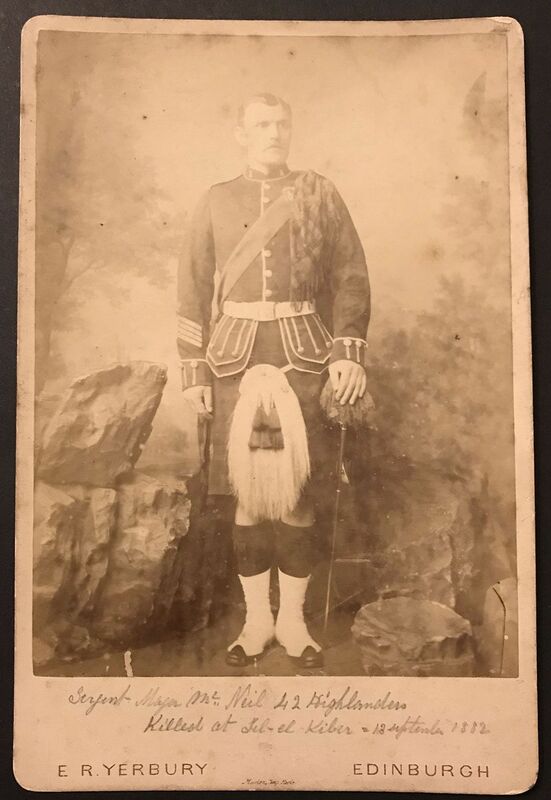 Cabinet card of "Black Watch" Sergeant-Major McNeill of the 42nd Highlanders. He was killed in action at Tel-el-Kebir in Afghanistan on September 13th, 1882. Wear as shown, Edinburgh front mark. Scarce view of a true hero! "The Duke of Connaught as Brigadier of the Guards was in his place at Tel-el-Kebir, but whether the Guards were in their proper place was doubted by the whole of the army, and by none more than the Guards themselves. To serve in a campaign without firing a shot or using a bayonet, ill became the history, the traditions, and the past reputation, of our corps d'elite."